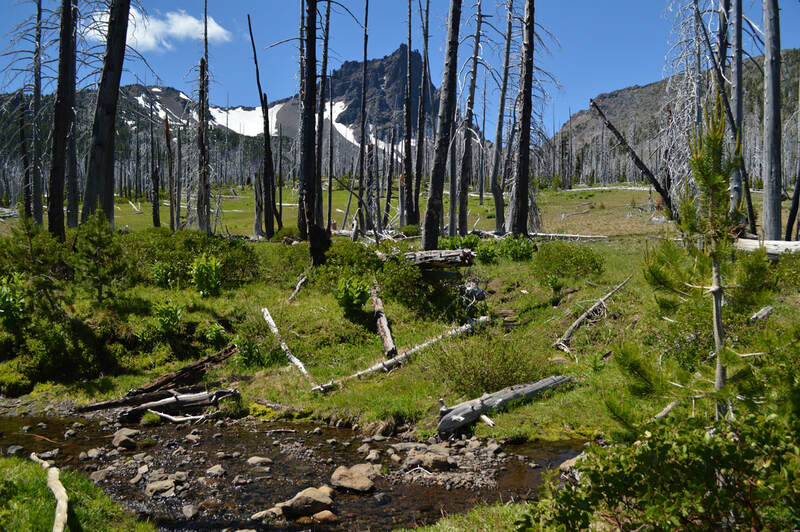 The loop around Three Fingered Jack is a popular 21.5 mile loop, starting at the Pacific Crest Trailhead at Santiam Pass. 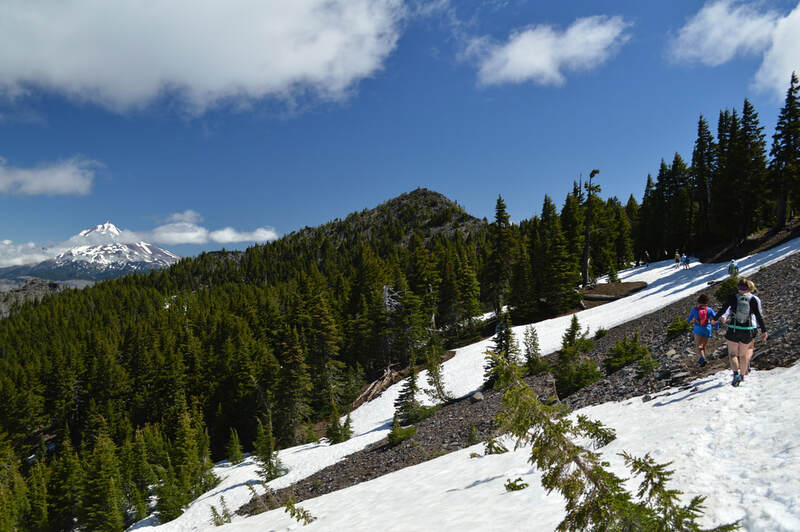 You can also start the hike at Jack Lake Trailhead, however the road up to Jack Lake is long and rough, so even if you're coming from Bend or Sisters, it will still take less time to drive to Santiam Pass. At the trailhead, don't forget to fill out your wilderness permit if you are hiking between May 30th and October 31st. 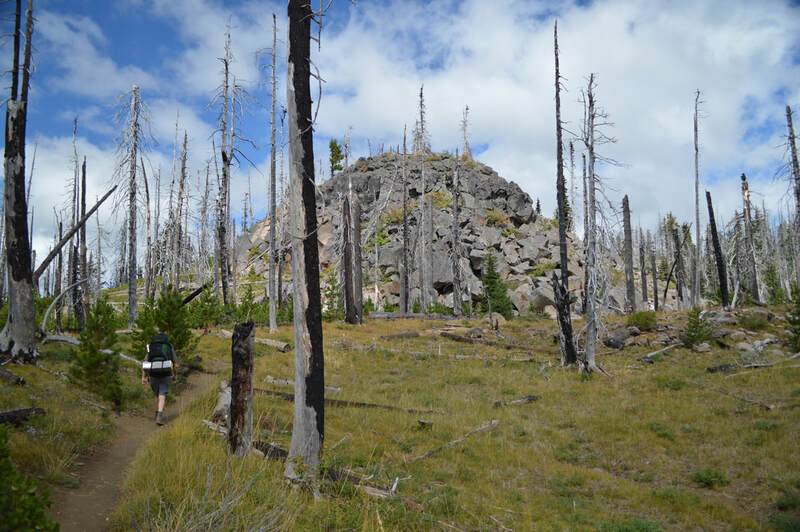 ​The hike starts out on the Pacific Crest Trail, heading northbound through bushy bear grass and silvery trees remaining from the very large B&B Complex fire in 2003. 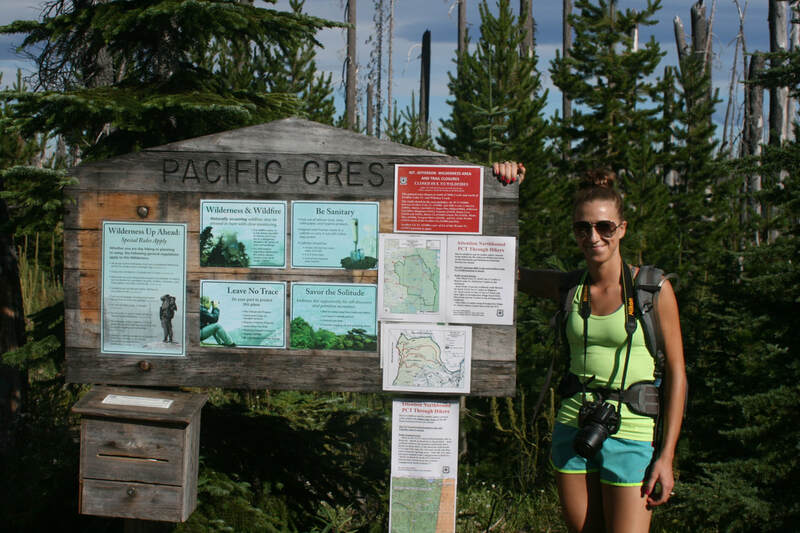 The Pacific Crest Trail will continue gaining elevation, as you head up the southern flank of Three Fingered Jack. The trail is dry and sandy until you get to the forest. Here the trail becomes compact and the further up you go, the more rocks you will encounter. 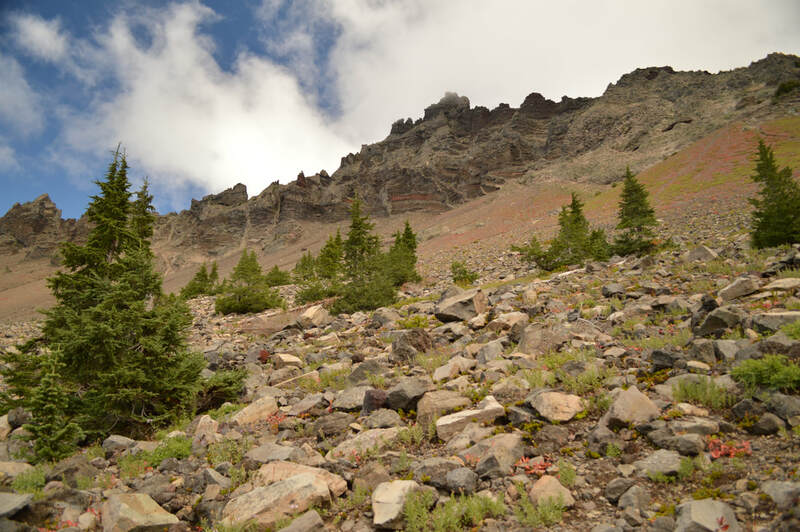 Watch your footing as you come around the west side of Three Fingered Jack, the trail becomes entirely rock for about a quarter of a mile and you will cross a few dry creek beds. Keep your eyes out for white mountain goats. They like to graze up here on the high slopes of the mountain and there is frequently a whole herd up there throughout the summer. 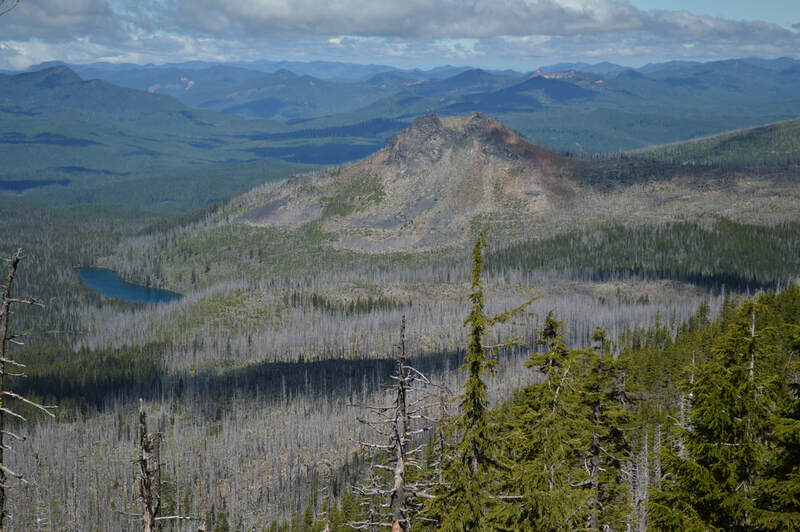 As you near the highest point of the trail, you will have expansive views to the west, where you will see Santiam Lake, Maxwell Butte, Duffy Lake and Duffy Butte, Mowich Lake and multiple other beautiful destinations. Eventually you will also see Mt. 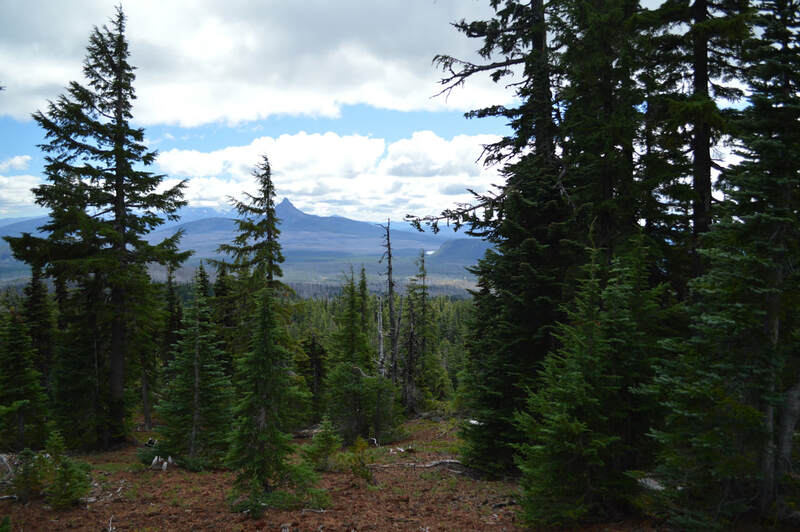 Jefferson to the north and you will continue seeing views of the mountain until you come around the northern side of Three Fingered Jack. 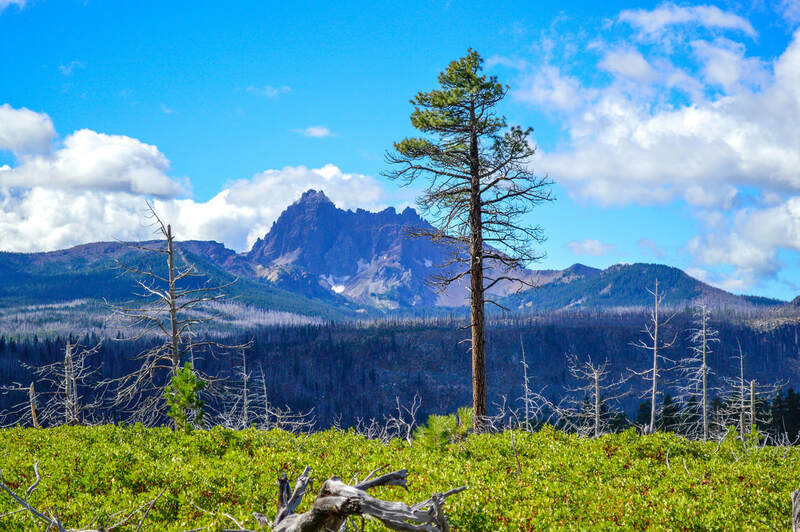 At the northern tip of the loop, there is a spectacular viewpoint of Three Fingered Jack. Here you can see the different layers of rock in the mountain, the various glaciers that hang on for dear life in this ever warming climate, and you can look down into the very green Canyon Creek Meadows area. From here, the trail switch backs steeply downhill toward Minto Pass. 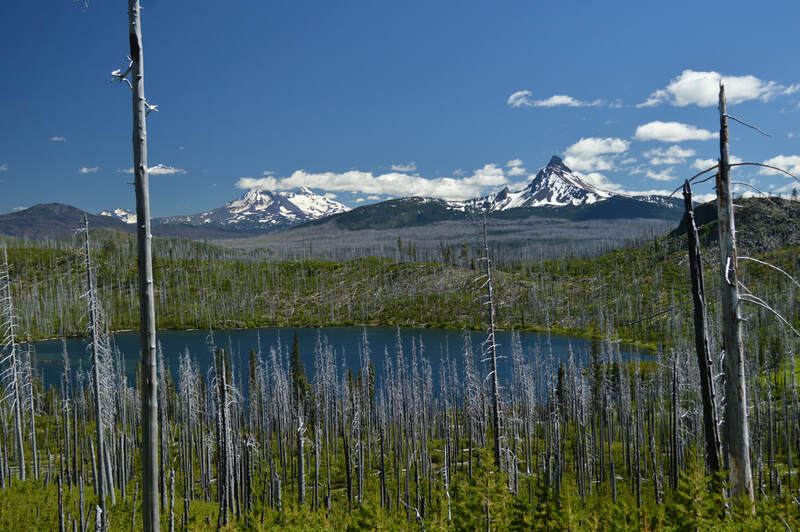 While heading down to Minto Pass, make sure you don't miss the awesome viewpoint of Wasco Lake. 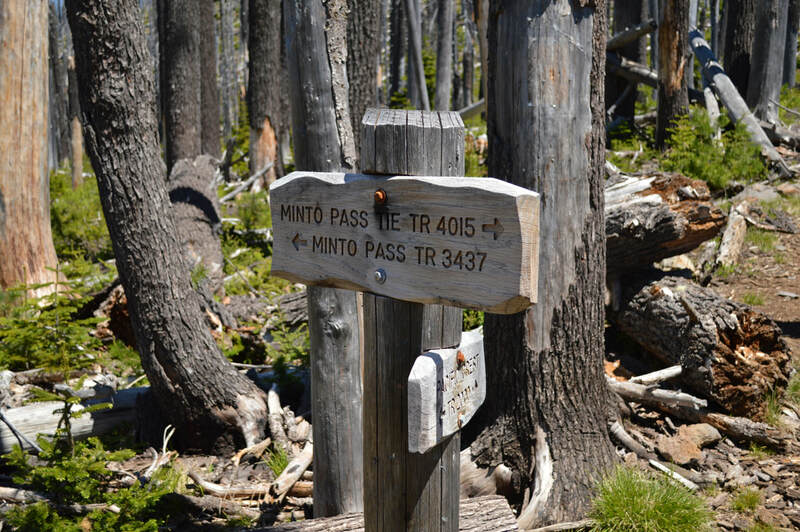 A few hundred feet past the viewpoint, you will see a trail junction, this is Minto Pass. Here the Pacific Crest Trail continues north 4 miles to Rockpile Lake (also a great place to backpack to), and the Minto Pass Trail continues east and west. Here you will take Minto Pass Trail #3437 to the right, which goes steeply down to Wasco Lake. There is plenty of camping at Wasco Lake if you are wanting to camp. At this point you are about 9 miles into the loop, which is a great almost half way stopping point. 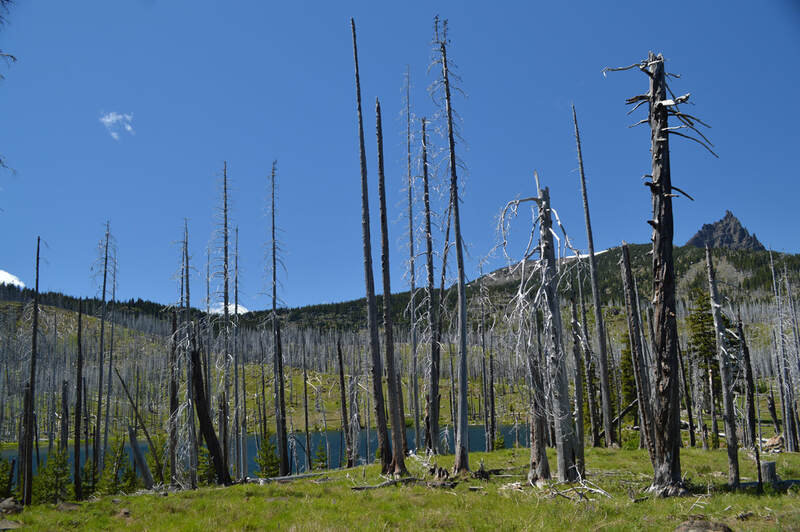 After Wasco Lake, you will see a few trail splits heading off to the right towards Canyon Creek Meadows. 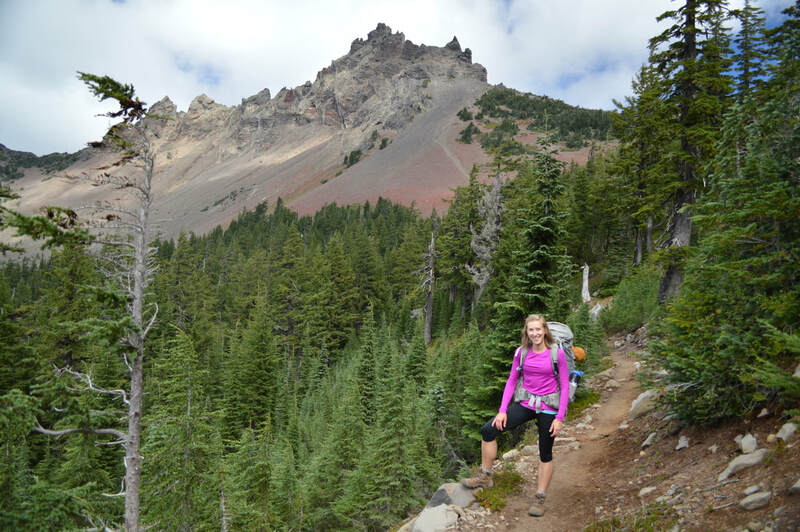 Unless you are wanting to check out Canyon Creek Meadows and add on 2.8 miles to the hike, make sure you continue to follow signs towards Jack Lake Trailhead. 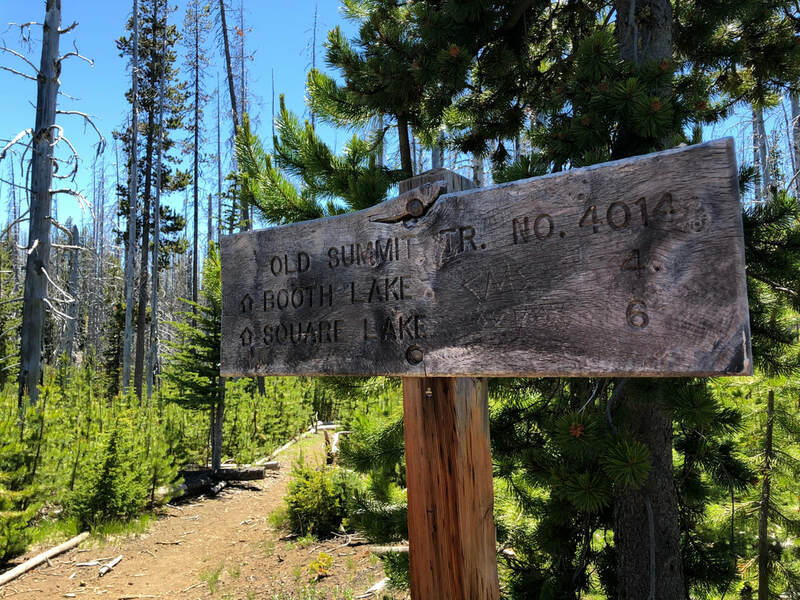 There is also some primitive camping at Jack Lake, and from there you will only have about 7.5 miles left of the loop, so some folks might opt to camp here. 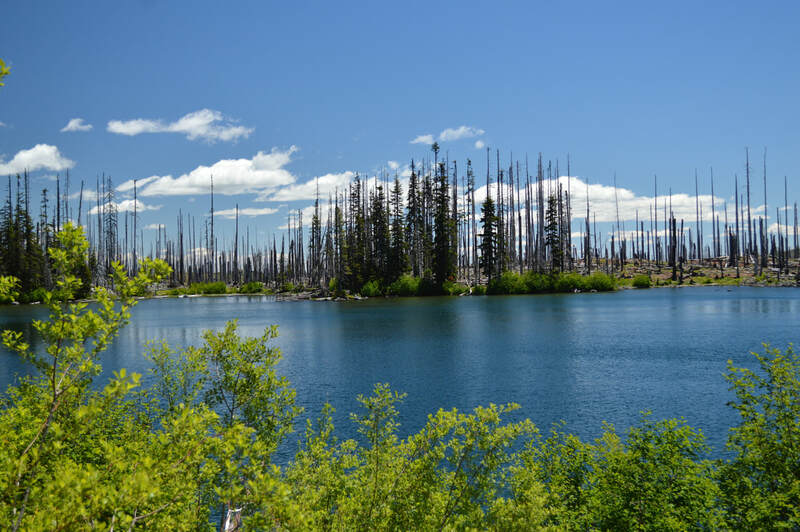 Although camping at Jack Lake is not as secluded as Wasco Lake because it is right by a very busy trailhead. Continue past Jack Lake on the Old Summit Trail #4014. You will stay on this trail for the remainder of the hike. The last 7.5 miles of the hike are all through sparse burn area, also devastated by the B&B Complex fire. 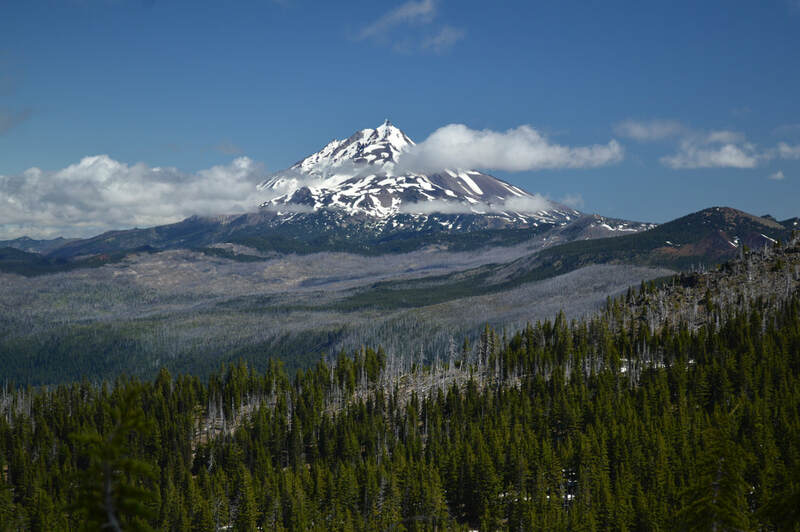 You will see miles and miles of silver trees, waist or shoulder high Snowbush and a few new trees that are trying to grow back in this harsh climate. This area gets extremely hot in the afternoon and there is absolutely no shade. Bring a hat, sunscreen, sunglasses, and if you bring your dog, PLEASE bring booties to protect their paws from the very hot sand! 4 miles past Jack Lake trailhead, you will come to Booth Lake. 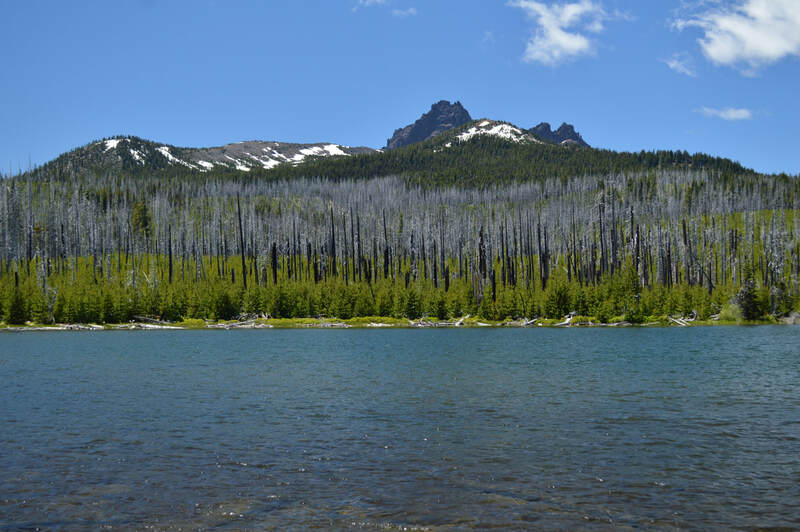 A small lake on your right, which great views of Three Fingered Jack. There is one primitive campsite here as well. 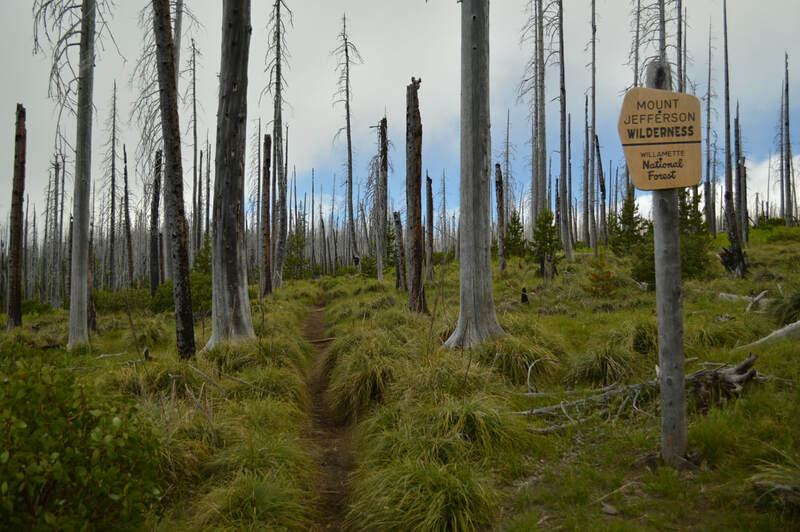 2 miles after Booth Lake, you will come to Square Lake and another trail split. At the junction, continue to the right for another 1.5 miles back to the car. Overall, this loop is great, and perfect for those wanting to experience their first time camping in the back country. The trail is a mixture between sand and rocky terrain, and there are only two spots where the trail has a steep drop-off. 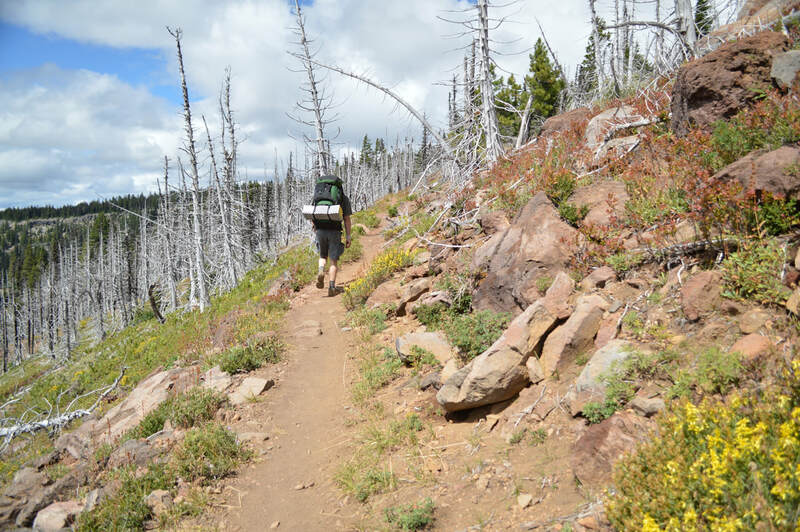 The terrain is not very difficult but due the trail being 85% exposed, it gets very hot and if you do not have adequate clothing to shield you from the sun, it can zap all of the energy out of you and make this hike a long slog. Along with your 10 Essentials, it is recommended you take a hat, sunscreen, sunglasses, electrolytes, and a water filter so that you can get extra water when yours is empty. So if you're wanting to spend a night or two out in the wilderness, this is an awesome hike for folks of all levels of hiking and backpacking experience. (Best time to go is August through October. Avoid the month of July due to mosquitoes in the area). ​Directions: Drive Hwy. 20 to Santiam Pass. About 200 yards east of the Hoodoo Ski Area sign, turn north at a well marked Pacific Crest Trail entrance sign. The parking lot here is large with a pit toilet.